Welcome to Big County Outfitters! We are located in central British Columbia on the North Chilcotin plateau. Our exclusive guide area consists of open grassy side hills, spruce swamps, heavy timber, lakes and streams, and logging cut blocks of various ages....simply put, "Prime Big Game Country". This area has been made famous in both historic ranching and guiding, in numerous books. We have a comfortable and efficient guiding camp that can be reached by vehicle from Quesnel BC. For clients wishing to fly in from Vancouver, we arrange pick-up and delivery from the airport. We are committed to working hard, continuous improvement, and having a great time. Our guides are local and have extensive knowledge of the area and the game. Our honesty, integrity, and open communication set us apart from other outfits. At Big Country, we specialize in Western Canadian Moose and Trophy Mountain Black Bear hunts! Whether you hunt with rifle, bow, or black powder... single species or combination hunts... we are the outfitters for you. Not only do we offer hunts on our exclusive guide area, but we also arrange and fully outfit hunts for other big game species. Grizzly bear, Mountain goats, Elk, Sheep; we work closely with some of the best areas to bring clients to their ultimate big game goals. Our Guide-Outfitter Territory is 2000 sq miles of virtually inaccessible wilderness located in the far north of British Columbia. Our area includes the north slopes of the Rocky Mountains, stretches across the Liard River, and then north to the Yukon border. The terrain is incredibly varied, offering everything from the alpine meadows of the Rocky Mountains, to the lakes, rivers and vast forests of the Liard Plateau. This diverse habitat provides a home for some exceptional wildlife including Stone Sheep, Canadian Moose, Mountain Caribou, Mountain Goat, Elk, Grizzly, Black bear and Wolf. GGO is owned and operated by Jake and Cecilia Gunson. Jake grew up with horses, and has hunting in his blood. He has over 20 years of experience guiding in Manitoba, Alberta, B.C., the Yukon, Saskatchewan, and the Northwest Territories. While growing up in the Northwest Territories, Cecilia spent her time hunting, fishing and camping with her family. We first established GGO as an archery-only whitetail outfit in 2001. After several years of operating in Manitoba, we sold our whitetail allocation and moved on to pursue other opportunities; Jake as an Environmental Scientist, Cecilia as an Occupational Therapist. Now, we have a young family and have decided it is time to get back to the life we love. 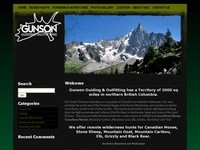 We have purchased a fabulous Guide-Outfitting Territory in northern BC and hope that you will be able to join us. In 2017, GGO decided to try something new: Spring Black Bear hunts. Jake has hunted/guided most species across western Canada, but had never really done spring bear hunts. We found a fabulous area that was operating ‘under the radar’ with a core group of repeat clients, who returned year, after year, after year. That told us about all we needed to know. We have been and are still working very closely with the former Outfitter, to learn as much as we can about his obviously successful operation. Each member of the TOA team is qualified and competent with the standards, guidelines, ethics and goals set forth by the owners and outfitters. 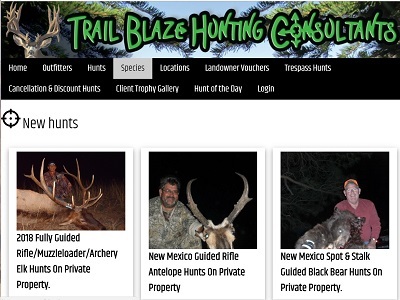 Trail Blaze Hunting Consultants specializes in guided, semi guided, DIY hunts and private property trespass hunts for all western big game species. We also specialize in Colorado, New Mexico, Nevada and Utah Landowner Vouchers (tags) for Mule Deer, Elk and Antelope. We work with some of the best western big game hunting outfitters in the business and have access to hundreds of landowners who receive landowner deer, elk and antelope vouchers (tags). We also specialize in Alaska Trophy Moose, Brown Bear and Dall Sheep hunts along with world class Mexico Mule & Coues Deer and Desert Sheep hunts. 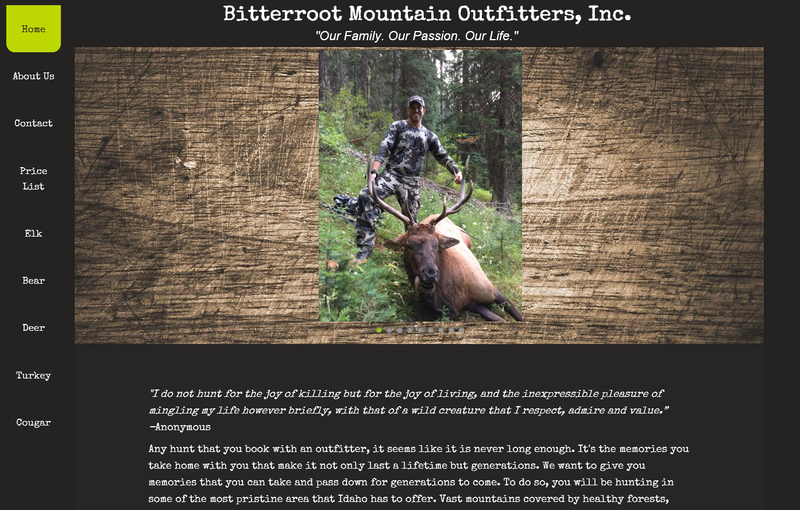 Fawnie Mountain Outfitters are licensed BC big game hunting guides & outfitters, offering guided black bear and moose hunts in the Chilcotin wilderness of British Columbia. The Chilcotin wilderness is well known for its dense population of Canada moose. Our main lodge at Moose Lake is in the heart of prime BC moose country. We live at the lodge year round, see the animals close by through the seasons, their hiding places are no secret to our guides. Each fall we harvest several good bulls from the lakeshore, and in easy riding distance from the lodge. Fawnie Mountain Outfitters have guided in the area in excess of 30 years, and have averaged a 95% success rate. Our area of British Columbia has many lakes, which afford easy floatplane access to our camps. The moose like the habitat provided by the lakes and the meadows that interconnect the lakes. Transportation used is horseback, boat, or backpack, depending on physical limitations of the client. Some trips are from the lodge, some are from cabins or tents on remote lakes - we try to match you with the right guides in the right location to achieve the best experience. We have successfully guided clients in all types of physical condition, and in ages ranging from 14 to 80 years. Antler size range from 40 to 55 inches wide. Our guides skin and cape the animal, trophy and meat are flown to Anahim Lake, a locker is available to process meat there. All shipping from Anahim Lake is your responsibility. We will transport head and cape to a local taxidermist if you want. 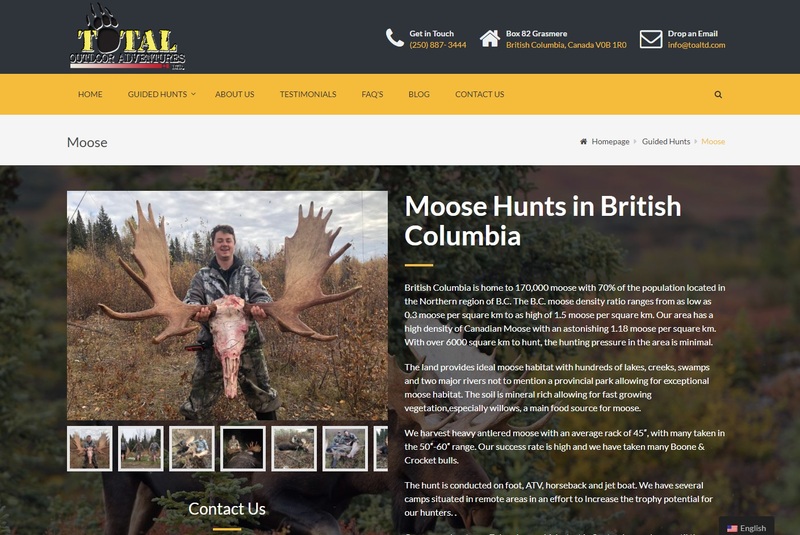 We offer big game hunting adventures in the heart of the British Columbia prime wilderness. Specializing in quality Canadian Moose hunting, Black Bear hunts, Grizzly Bear, Mule Deer, White Tail Deer and Wolf hunts. Our guiding territory is rich in hunting heritage under the former guide outfitters Fred Colebank and Ralph Maida, offering first class British Columbia hunts for over 50 years. The present Outfitter, Ken Watson, has extensive knowledge of the area having worked with Fred and Ralph for the last 21 years. Our beautiful main Lodge is situated on the shores of crystal-clear Opatcho Lake. This lake is full of trophy size rainbow trout with some exceeding the 10 pound range. Our hunters stay in comfortable log cabins and enjoy our hearty home cooked meals. Real hot showers and a sauna are just a few of the amenities to mention in our fully equipped base camp. MOOSE HUNTING: Our 2500 sq mile area has one of the highest moose populations in North America. We have hundreds of lakes, swamps and three major river drainages that form a perfect moose habitat. Average bulls range from 40 to 50 inches. The early season moose hunt (mid September) is done mostly over water as bulls are feeding on aquatic plants at this time. We also hunt some parts of the high country. This hunt can be combined with Black Bear, Grizzly Bear, Wolf and Deer. The moose-rut hunts run traditionally between mid September thru mid October. During this time moose respond to calling and are usually very active. This hunt can be combined with Black Bear, Grizzly Bear, Wolf and Deer. The late season hunt (Oct 26 thru Nov 5) is excellent as well because we usually have snow which makes it easier to locate the moose. Moose are generally feeding on willows in logging areas, around lakes as well as in old burns. This hunt can be combined with Grizzly Bear, Wolf and Deer. Migule Mt Outfitters and Beaver Mt Camps have been operating for over 40 years. Started By Dave Toms in the early 60's and now run by son Paul. Our knowledge of big game hunting will help to ensure a most memorable hunt and one that will make you want to return. Many of our clientele have been returning regularly for many years. Come as a hunter leave as a friend. We operate a drive to lodge located in the central region of NF. You will have the opportunity to harvest all 3 big game animals (moose, caribou and black bear) in the same general hunting area. Success rates are steady at approx 90% for the past 15 years. Hunts are 5 days in duration in which hunters should arrive on Sun in order to start the hunt first thing Mon morning. We hunt full days with lunches in the bush unless otherwise stated (guides will carry lunch for both). Our method of hunting usually involves spotting as well as a fair amount of walking through some rugged terrain (bogs, brush, streams etc). ATV's are used for transportation to and from bush as well as for retrieval of game. BC Guide Outfitters operates its Moose and Bear hunts within a 900 square mile plateau of prime Moose and Bear habitat. We have over 200 lakes and 3 major rivers. We have a diversity of remote wilderness and replanted cut blocks. This has created some of the best Moose and Bear habitat in the world! It provides feed in the logged area, but still enough cover to create a safe haven for wildlife. At the recent Moose workshop with BC's Fish and Wildlife dept. It was pointed out that our game managment zone had one of the highest Moose populations in BC! This is what led to the best fall Moose season in 20 years this past year! We have a great Base camp with cabins for our hunters on our lake front property. Some hunts are conducted from our base camp and some from our remote camps on remote lakes and rivers. In addition to our Moose and Bear hunts, we also offer premium wilderness hunts throughout our family of guide territories for Elk, Whitetail Deer, Mule Deer, Mountain Goat, Grizzly Bear, Cougar, Lynx and Wolf. We pride ourselves on a reputation for friendly hardworking guides, awesome home cooked meals and well stocked camps. We have a very high return of hunters year after year. We are told that we make our clients feel at home and are treated like family. References are available upon request. One of the secrets of our success has been that we are full time Outfitters. This is what we do. We spend from April to November in our camps and our territory, cutting trails, hauling in boats to remote lakes and building camps in the backcountry. We are also on the landscape scouting all season long. That is the difference between a full time operator and those that show up the week before the hunt and throw it all together. Give us a call, we would love to chat!